Born in Madrid, Gris settled in Paris, joining the avant-garde circle of his compatriot Picasso and becoming one of the principal exponents of Cubism. Like his fellow Cubists Picasso and Braque, Gris experimented with collage, incorporating bits of wallpaper, fragments of mirror, and pages from books in his paintings from 1914. Although this picture, which dates from the following year, is painted entirely in oils, it imitates a collage in the convincing faux-wood grain of the table and the fictive scrap of paper that appears pinned to the bottom of the composition. This detail betrays Gris’s admiration for the seventeenth-century Spanish paintings he would have seen on childhood visits to the Prado. The text it bears, however, is decidedly modern: a poem written by the artist’s friend Pierre Reverdy, for whose collection of abstract prose poems Gris painted a set of watercolor illustrations. Mr. and Mrs. Henry C. Clifford, Philadelphia and Radnor, Pennsylvania. 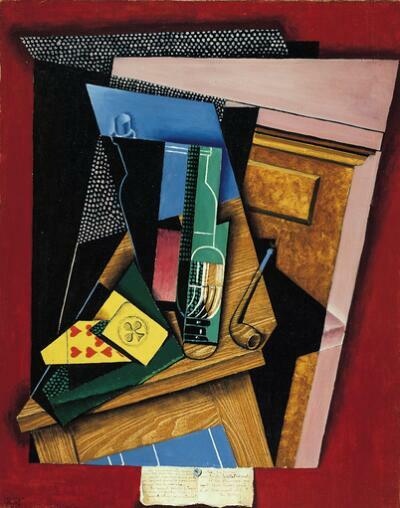 In this tightly structured still-life by the Spanish Cubist Juan Gris, a wooden table becomes a series of angular planes, overlapping and jutting in various directions. Gris’s masterful painted illusion of wood, cloth, and paper incorporates varied patterns that simulate the textures of the actual materials. Gris called his painting “flat, colored architecture.” Here, the surface play of colored patterns and linear designs cancels out the illusion of depth created by the overlapping planes. Gris was one of the first exponents of Cubism. A neighbor of Picasso in Paris, he watched its development from 1907 to 1912. By 1915, when he made this painting, he was adapting Cubist innovations to his own methodical temperament to create a unique variation of the style.